What does “simplicity” mean to you? The more I explore simplicity, I realize it means different things to other people. Or maybe, from many angles, simplicity can look different. Tell everybody what simplicity means to you! Can it be achieved? Is it easy or hard? Any great examples? Do you have a simplicity mantra? Add your comment below. If you have a blog, send a trackback to this post. There could be a free book in it for you. 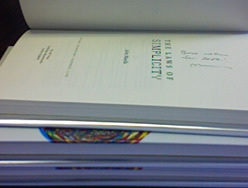 John Maeda was kind enough to sign a few copies of his book, Laws of Simplicity for me. I’m giving them away to random commenters and trackbackers. In December I wrote a series of posts based on this book. It’s a quick read full of great ideas. And it could be free if you enter by January 15. Based on my last book giveaway, you’ll have a great chance to earn a free book. So, what does “simplicity” mean to you? In this particular case, simplicity means that you should just give me a copy of the book because I’m your friend. It simplifies the process of giving away books, and it simplifies the process I have to go through to get one. Maybe it’s just because I finished up GTD, but for me simplicity is getting everything out of my mind so I can make right choices, well, simply. Simplicity is one of those things that only ever pops into my head when it’s absent. It’s not something anyone achieves, but success is marked in how closely one comes to it–sort of like being a good person, or golfing a perfect game. Similar to what Jon said I think simplicity can really only be defined in relation to complexity. Simplicity is simply anything that is not complicated. I often equate “simplicity” with “elegant completeness”. This is often the very straightforward answer or approach that is too obvious for those nearest the problem to appreciate the simple answer. Visually, this is the antithesis of the fourteen page NDA; instead, it is simply a single word on a page: “Trust”. Simplicity resonates at the human level.